I really need to get some more of these Stampotique stamps, I really love them and I keep using the same ones over and over haha!! Anyway, for this Stampotique Designer Challenge the theme is Red, Pink and White. and I decided to play with acrylic paint, stencils and paper and all kinds of fun things. I ended up creating a wonderful red background with so much texture. I decided to use it for the base of my tag. I colored my girl with Tim Holtz distress markers and also my skeleton men. I used Tim's movers and shapers heart die to cut out the white and pink hearts and I free-handed the red heart and cut it myself. I need that one to be bigger so it would cover up the guys. I used a lid to make the white circles and added a bit of black soot distress ink and stenciling. For the ribbon I used Barn Door distress stain to add some color and then I stamped it with an old Stampin Up background stamp that I had. Here are some close ups of the tag. I hope you enjoyed the tag, I must run and get some dinner going. Hubby is going to think I'm on strike!! haha! 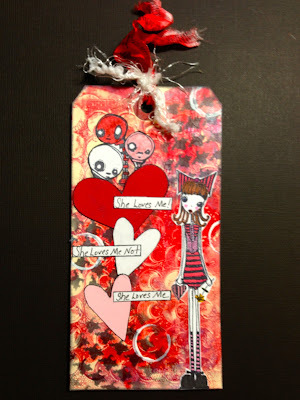 O Claudine, I love your tag, the depth of colour and the way you used your stamps is just fab! Such a fun tag. 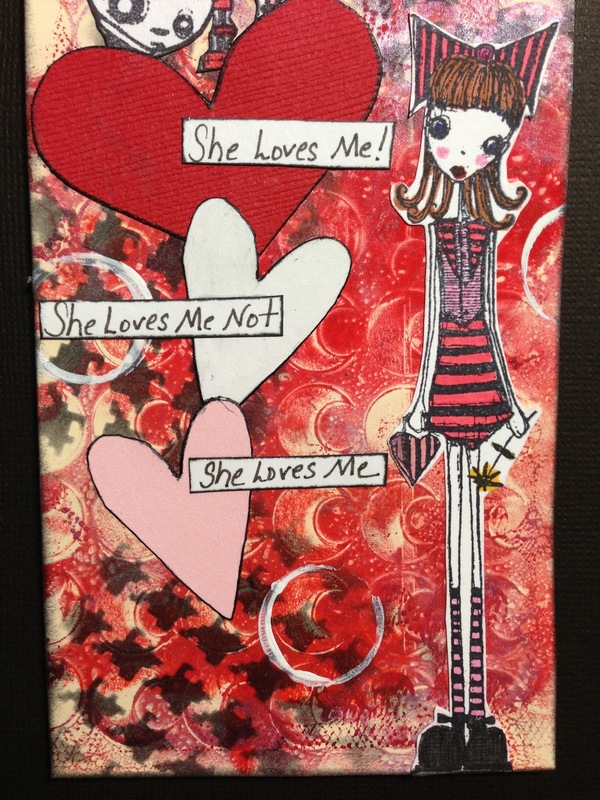 Love those Stampotique images! Love it! 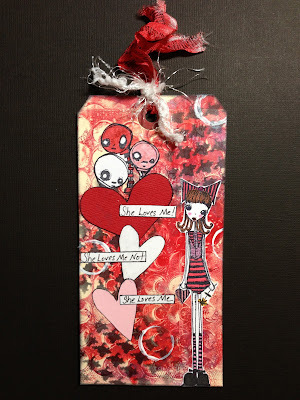 Amazing background and so many Stampotique stamps in one small tag! Great! Thanks for joining us at Stampotique challenge! Eeeek this is wonderful... so much depth. I love the quote. 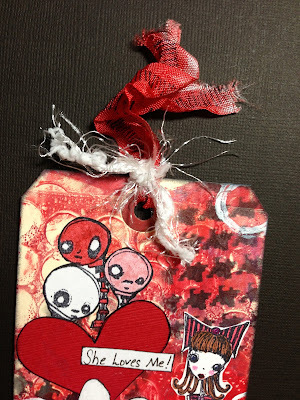 Thanks for joining us at Stampotique Designers Challenge this week. This tag is fabulous! Love those heads popping up from the hearts! :-) Thanks for joining us at the Stampotique Designers Challenge!